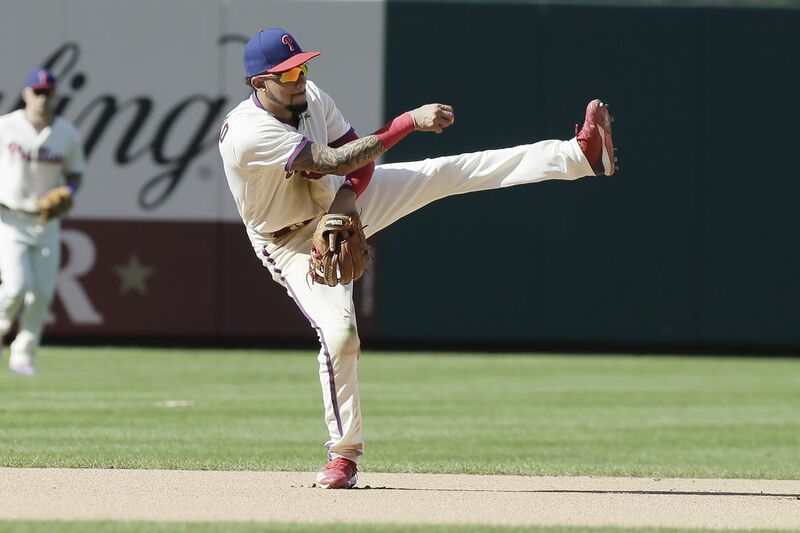 Phillies shortstop J.P. Crawford fields a ground ball on Sunday. Gabe Kapler does not want to look to 2019 until his final chip in the postseason race has been spent and his chair at the playoff table has been removed. But the Phillies manager — thanks to Monday night's injury to Asdrubal Cabrera — will now be able to get a better look at J.P. Crawford while the Phillies are still clinging to their slim playoff chances. Cabrera said his left calf felt better Tuesday after he strained it Monday night while playing third base. He was replaced Tuesday night by Crawford, who started for just the fourth time since returning to the big leagues earlier this month. Cabrera is unsure of how long he will be out, but it would not be a surprise if the Phillies stressed caution with him over the season's final two weeks. Crawford's role going into 2019 remains uncertain. Is he a shortstop or is he a third baseman? Perhaps, he can be both. That will likely be determined by what happens around Crawford. If the Phillies sign a shortstop, say Manny Machado, then Crawford will be a third baseman along with Maikel Franco and Scott Kingery, who will either continue with his utility-role in 2019 or move to second base if the Phillies move Cesar Hernandez. So much of that is unknown. But for the final two weeks of the season, the Phillies will at least get to take a look at Crawford. "I am excited about it, I really am, and kind of thinking about where I wanted to slot him in in the lineup knowing that Matz is not necessarily going to be in the game the entire game," Kapler said of batting Crawford sixth on Tuesday against Mets lefthander Steven Matz. "The first and most important consideration, given the way he's been swinging the bat, is let's see if we can get him to come up with the game on the line at some point. And the further we push him down, the less likely that it happens. I just feel that he's having very, very competitive, strong at-bats." Maikel Franco's sore shoulder has improved enough that he expects to be available on Wednesday off the bench. Franco has been out since Sept. 11 when he fell over the guardrail behind third base. "He said he felt good today and one more day would be optimal," Kapler said, saying a word he often uses. "He didn't use the word optimal, by the way." Aaron Loup was activated off the disabled list before Tuesday's game, giving the Phillies a full 40-man roster for the rest of the season. …Zach Eflin will start Wednesday's series finale against righthander Noah Syndergaard.